This week, AIA | DC released its 2014 Chapter Design Awards highlighting some of the best architectural design, including categories like urban planning and interior architecture, produced in the DC region this year. The awards are given to 30 selected entries from a pool of 181 entries featuring DC area projects and architects. The category of urban design and master planning was included for the first time this year, according to a news release. Here’s a look at some of the projects selected by the AIA|DC juries this year. These and the rest are on display for free at the District Architecture Center beginning today through January 3, 2015. The Arts Walk at Brookland Works — the building near the Brookland-CUA Metro with “Brookland” written across the facade — was awarded a Presidential Citation in Urban Design. AIA | DC noted that the 15-foot letters are “place-making” for the neighborhood. 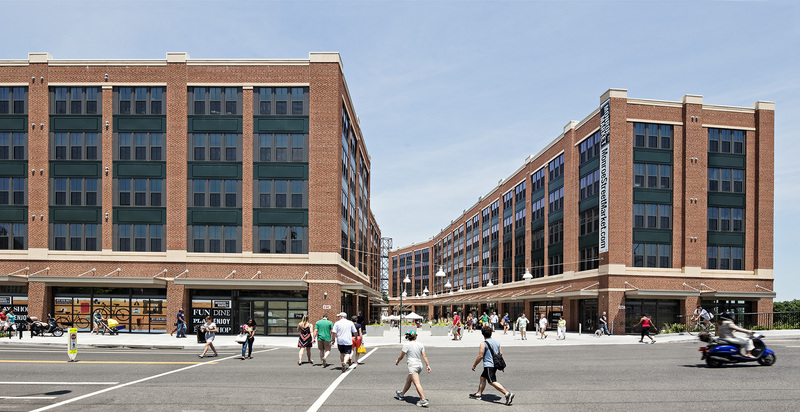 The Arts Walk is adjacent to Brookland Works, a 150-unit apartment building in the Monroe Street Market development. Artists’ studios open up onto a public promenade where events, including a weekly market, are held. The jury praised the development’s connectivity to the Metro — pedestrians previously didn’t have an easy route to the station from 8th Street or the south — and its connection to the Metropolitan Branch Trail, as well as the use of open space. The project was designed by Maurice Walters Architect with KTGY.